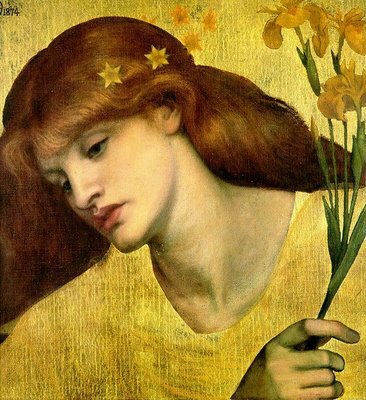 Lizzie Siddal was a captivating woman, with entrancing features and flowing red hair. Often referred to as a 'supermodel' of the Victorian Era , Lizzie captured the public eye as a model for the controversial Pre-Raphaelite Brotherhood, who were reintroducing dramatic realism and subject matter into an artistic period burdened by landscapes and idealised figures. Key players in the Brotherhood were John Everett Millais and Dante Gabriel Rossetti. Other painters such as John William Waterhouse created their own spin on the Pre-Raphaelite style and started gently nudging toward the Neo-Classicism that consumed European Art, prior to the rise of the Impressionists. But this article isn't about the Brotherhood, but an individual whose story has endured the ages as the muse of the Pre-Raphaelites. Lizzie Siddal was first noticed by painter Walter Deverell when working in a milliners. She was from a middle class background, whose family had fallen into hard times following legal battles over ownership of a business. At that time, modelling was likened to prostitution, and not an occupation a respectable Middle Class woman would readily contemplate. However, owing partly to her family's fianancial poistion, and partly to her interest in art, Lizzie did not require much coaxing into the position. Formal permission was sought - and received - from Lizzie's parents to legitimise her participation and she began her work soon after. Whilst not formally a member of the Brotherhood, Deverell shared a studio with Rosetti, who introduced Lizzie to Millais. The most famous of the paintings featuring Miss Siddal was Millais' Ophelia (1852) depicting Shakespeare's tragic heroine moments before her death. The tale of how this image was created has become famous in the History of Art. Having chosen Siddal as his model, Millais wanted to submerge her in a bathtub to capture the positioning of her body in water as effectively as possible. He designed a heating system for the bathtub using a set of lamps. Unfortunately for Lizzie, the system malfunctioned and she was forced to remain submerged in the cold water for hours. By the end of the sitting, Lizzie had taken ill. It was this stunning painting which gave both Millais and Siddal their place in History. The painting itself is a masterwork of realism, and was painstakingly produced over 1851-2. Lizzie continued to model for the Brotherhood, though chiefly for Dante Rosetti, with whom she was having a torrid affair. Lizzie was a writer and painter herself, and much of her work points toward the difficulties of her relationships. Made worse was the fact that Rosetti was a famous womaniser. Eventually Rosetti married her but even during this time, was having flings with his other models, such as Jane Burden - whom famously appeared in paintings such as Proserpine(1874). Lizzie was buried with manuscripts of her poems, but this was later exhumed by Rosetti, and have been preserved for posterity in printed form and online. 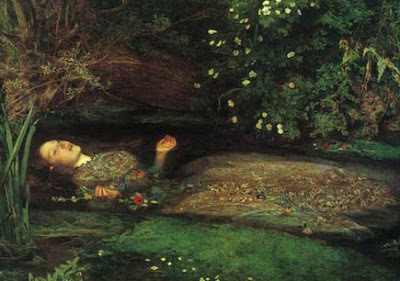 The 2009 BBC TV Drama series Desperate Romantics, heavily features Millais and Rosetti, including their involvement with Siddal, and recreates the infamous sitting for Ophelia in Episode 2. A BBC Four Documentary named The Pre-Raphaelites-Victorian Revolutionaries was also aired in 2009. Here is a decent snippet about the creation of Ophelia. More detail about Lizzy and her works can be obtained from the Lizzie Siddal.com Blog. An amazing reference title worth a read is Lucinda Hawksley's Lizzie Siddal - Tragedy of a Pre-Raphaelite Supermodel. Hi @clareangela - welcome to 3PP! Cheers for the reference. That sounds like a fascinating title for PRB/Lizzie fans to explore - for those interested im finding out a bit more - there is a short review here and well as a 'look inside' preview at amazon.